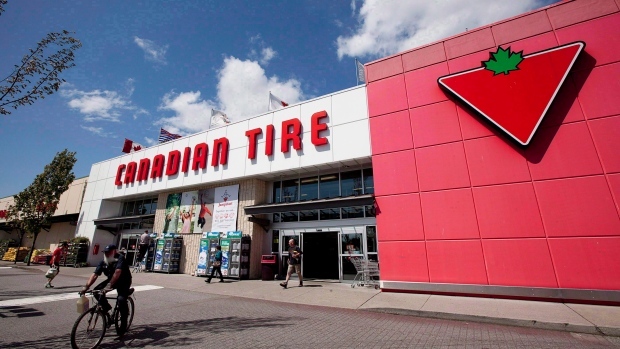 TORONTO -- Canadian Tire Corp. Ltd. (CTCa.TO) raised its dividend following a quarter spent quietly staging a return to the e-commerce marketplace. The Toronto-based retailer reported Thursday that a spike in third-quarter profits and sales had caused it to increase its quarterly dividend to $1.04 per share, up from its previous 90 cents. The dividend spike was triggered by Canadian Tire earning $231.3 million or $3.15 per diluted share for the quarter ended Sept. 29, compared with a profit of $198.5 million or $2.59 per diluted share a year ago, and reporting revenue totalled $3.63 billion, up from nearly $3.27 billion. Canadian Tire shares spiked on the news, closing up $16.25, or 10.84 per cent to $166.10 on the Toronto Stock Exchange. The increases came days after Canadian Tire, which also owns Mark's, FGL Sports and Helly Hansen, revealed it was launching home delivery and in-store pick-up available through self-serve storage towers. The company abandoned its e-commerce strategy about a decade ago, saying it was not adequately prepared. President and chief executive officer Stephen Wetmore, who "cancelled" the company's e-commerce plans in 2009, appeared to be more optimistic about the move this time. "It is a year of execution for Canadian Tire and we have made extremely good progress," he said, noting e-commerce as one of the company's achievements. "There is a long list of what we have accomplished this year with a sole intent of building a stronger, more capable company." It is "early days," Canadian Tire's retail president Greg Hicks added, but so far, he said users are gravitating more to the click-and-collect option it offers. The push into e-commerce comes as Canadian Tire is facing similar efforts from retailing rivals including Walmart Inc., which is launching self-serve towers of their own, and online giants like Amazon Inc.
Hicks described its rivals and the strategies they are deploying as "highly competitive," but said they haven't seen much price inflation. "Nobody seems to want to give an inch. I expect that to continue," Hicks said. "The competition is ensuring they keep their fair share. We think we have a good pulse on how to react to that." The company also said it hasn't seen a lack of sales because of slowed growth in Canada's housing markets and noted that it has yet to be impacted by Canada increasing its de minimis level -- the value of product consumers can buy online without being forced to pay import duties or taxes -- to $150 for custom duties and $40 for sales taxes under the renegotiated North American Free Trade Agreement. The U.S. had been pushing for Canada to raise their threshold from $20 to $800. "That for the most part has turned out where we expected and wanted it to turn out," said Wetmore. "It is not a material concern for us at the moment, but we will obviously keep an eye on it."